Deri responds to petition calling on him to ban Women of the Wall from the Kotel, says he is doing everything in his power to combat group. 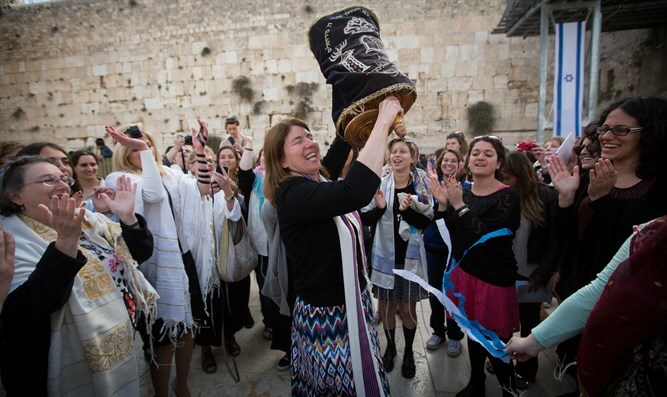 Calling Women of the Wall "a destructive phenomenon", Interior Minister Aryeh Deri said that he was doing everything in his power to stop the feminist group from holding their monthly prayers at the Kotel. Deri was responding to a petition signed by hundreds of religious women that called on him to use his powers to stop Women of the Wall from holding their noisy Rosh Chodesh prayers at the Western Wall. "For years, we have been warning of every stage and working with all the tools at our disposal to stop the destructive phenomenon of the Women of the Wall, whose sole purpose is to harm and humiliate the most sacred place for the Jewish people and to break the customs that have always existed in the area," wrote Deri in response. According to Deri, the Women of the Wall "cause a great storm and a deep blow to the feelings of the masses of Jews in Israel and the world who hurt by the blasphemy". "The frequent provocations in the Western Wall Plaza are subject to the influence of law enforcement and law enforcement agencies, who examine every Rosh Chodesh whether they violate the guidelines set in order to bring about police intervention," continued Deri. "When I entered the Ministry of Religious Services I instructed my staff to personally observe Rosh Chodesh with respect to what is happening in this holy place, and I intend to require the law enforcement authorities to issue clear and explicit instructions regarding the behavior in the area and the manner in which they will be enforced by these bodies. " On Thursday, the Women for the Wall group, which opposes the non-Orthodox prayer services, had sent a letter asking Deri to put an end to the monthly non-Orthodox prayers. According to the petition, "this extremist group blatantly violates the custom of the place, which all the people of the Wall respect, and provokes quarrels in the holy space." "While they are in the square, the prayer of the hundreds and thousands of women who come to pray with the help of women is critically disturbed." "When the women of the provocation dance, sing loudly, clap their hands and protest and riot in the holy place," the petition continued, "It is very difficult to hear the cantor or to concentrate on prayer in the face of the contempt of the holy place." For years, the Women of the Wall have demanded they be allowed to hold alternative, non-traditional services. Five years ago, Israel built an area allotted for mixed-gender prayer and for the Reform and Conservative movements to pray as they wish, but the Women of the Wall insist they should be allowed to pray their way in the main plaza. The monthly Women of the Wall prayers have led to clashes between the feminist group and other worshippers, who object to the non-Orthodox nature of the prayers.